We Buy Santa Barbara Houses Fast for Cash! Sell Your Santa Barbara Home Without Stress, Hassle or Headaches - Guaranteed! No repairs, upgrades or improvements are needed. You'll receive cash in the form of a check or wire-transfer. We'll close escrow in 7 days or whenever's best for you! Santa Barbara County is one of the most unique real estate markets in California. It’s sometimes hard to distinguish what buyers are looking for. With such a wide array of properties at staggeringly different price points, buyers of all sorts pop in and out. Selling a home fast in Santa Barbara County isn’t always a straightforward process, and it might require a little more research than you suspect. 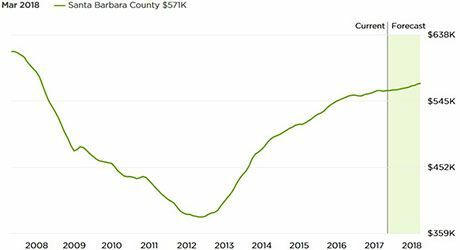 Though the average Santa Barbara county home value is $550,200, there are homes worth more than twice that average, or less than half of that average. At first glance, it seems as though there’s no rhyme or reason to home values. There are plenty of properties below $300,000, which is a typical budget for a small family home. There are also properties that surpass $1,500,000, and they’re just a short drive away from these family residences. Santa Barbara is astoundingly diverse as far as real estate is concerned. There are multiple standards of living in Santa Barbara County, which has led to every type of property imaginable. Most counties in California have slight variations in real estate averages from area to area, but Santa Barbara’s are undoubtedly vast. Homes that are practically down the street from each other could differ in price as much as 300%. Newer construction is worth far more than older construction, and this has a significant affect on averages. Santa Barbara has a significant split between modern and dated homes. The modern homes put a significant boost on that figure, and older homes may fetch as much as $100,000 less than their newer counterparts. 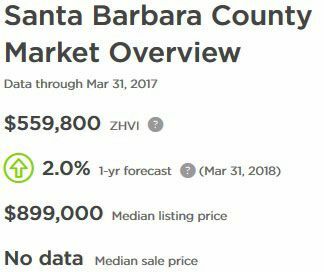 The market in Santa Barbara County is considered stable. In essence, it’s neither good nor bad. Having so many different kinds of properties of varying ages in a relatively small area makes for some unique market conditions. In Santa Barbara County, nothing can truly be considered “typical”. With all sorts of standards of market measurements floating around the county, each home is evaluated by its unique circumstances. Think of each neighborhood as its own micro-market. Though the market is stable, that doesn’t necessarily mean it’s healthy. More than 12.1% of properties sell at a price cut. 16.5% sell for below their previous sale price. The homes that are appealing to buyers sell within an average of 73 days, with spans of 30 to 90 days comprising the majority of sales. Homes sell best in summer, and the beginning of the year sees the longest listing times, sometimes exceeding 100 days. Sometimes, there’s simply no way to predict the outcome of a sale. Trends are a little erratic, but have not been labelled a cause for concern. Homes are selling, but there’s no telling which homes will actually sell – or when they will if they do. This leaves a lot of homeowners frustrated with Santa Barbara County’s real estate market, inspiring them to investigate alternative methods for the sale of their home. What if You Weren't Able to Sell on the Market or Need to Sell Fast? It’s not uncommon for Santa Barbara County homeowners to find that the market isn’t working in their favor. It may seem as though there’s no rhyme or reason to what is being purchased, and based on current trends, this may be true. This can be frustrating for homeowners who are looking to sell their house quickly, such as the 1 in 10,000 Santa Barbara County homeowners who are facing foreclosure. The market is somewhat loose, and there may be nothing you can do to speed up the process on your own. If your neighborhood plays a factor, you’ll also find that your hands are tied. Buyers tend to shy away from the west side of Santa Barbara due to higher crime rates. This is especially true for families with children. You never know who is looking to buy, and your neighborhood may dissuade someone who would have otherwise loved your property. You aren’t alone if you’re having difficult selling your house on the traditional market. The only reliable alternative is to sidestep the typical process, and go for a buyer who doesn’t have the same interests that the average buyer would have. Someone who can buy any type of property, with any type of defects, in any type of neighborhood might be able to help. In most cases, you can find this help in the form of a reliable home investment company. Why Should You Consider Selling to a Real Estate Investor? If it seems like nobody else will buy your home, an investor will buy your house almost always. They don’t look at a property through the eyes of a traditional buyer. They see a property, consider what a traditional buyer would find most attractive, and set out to make the property meet those standards. Home investors put in a lot of work, and sell the home themselves. If you don’t want to wait around, the investor does the waiting for you. Southern California Home Buyers is one of these investment companies. If you’re having a tough time in Santa Barbara’s unusual real estate market, we’d be happy to help you bypass the complications of working with a realtor and the long waiting period thereafter. Simply provide us with your property's details that you’d like to sell fast, and we can draw you up a quick cash offer. If you want the process to be short and simple, we’d love to accommodate you. To get request an offer on your home simply fill out the short form listed here. We'll research your property, run comps & call you back to discuss your situation and needs. Alternatively, call us directly at 951-331-3844 to speak with a member of our team and learn more about what we can offer you & how our process works.